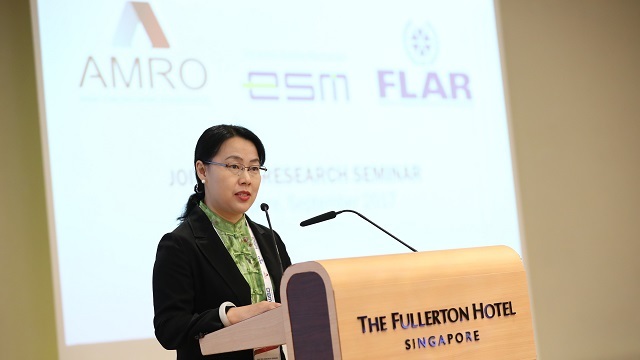 AMRO Director Dr Junhong Chang delivers opening remarks at the 1st Joint RFA Research Seminar on September 7, 2017, in Singapore. 1. I am delighted and honored to welcome you all to the first RFA Research Seminar jointly organized by AMRO, ESM and FLAR. It is our great pleasure to host this event here at the Fullerton hotel, a historic landmark of Singapore. Built in 1928, the Fullerton building was the largest structure ever built in Singapore at that time. It reflected optimism and symbolized the modern Singapore. 2. In line with such spirit, this inaugural Joint RFA Research Seminar is an important milestone reflecting the optimism and strong commitment of RFAs to collaborate and enhance the effectiveness of the Global Financial Safety Net or the GFSN. 3. This seminar is the outcome of the first High-Level Dialogue on the role of RFAs held in Washington, D.C., last year, where we agreed to organize this seminar on an annual basis. Through this seminar, we can discuss issues and solutions to make RFAs more responsive to the increasing need for enhanced collaboration and synergy between the different layers of the GFSN urged by the G20 since 2011. In an increasingly integrated world, global and regional financial arrangements should be enhanced and should cooperate better with one another to form a comprehensive and effective safety net against financial crises and contagion. 4. The increasing role of emerging markets and the rapid rise of financial interconnectedness have changed the dynamics of the international monetary system. The Asian Financial Crisis and Global Financial Crisis have taught us important lessons on the need to strengthen the GFSN. It is notable that the IMF will still be at the center of the GFSN. However, the expansion of the GFSN since the 2008 was driven largely by the rise of RFAs. With such multi-layered structure, collaboration between different elements of the GFSN has become more and more important. Expanding the role of RFAs in the GFSN can contribute to safeguarding regional and global financial stability. As most of the RFAs are in the early stages of development and some are more experienced, exchanging views on best practices, enhancing our capacity and building stronger collaboration between the IMF and RFAs, as well as among RFAs ourselves are fundamental. 5. The IMF Board has recently discussed a framework for collaboration between RFAs and the IMF. In particular, they discussed the operational principles for collaboration and came up with operational modalities for collaboration. It is now time for us to elaborate on the collaboration process, as well as the way to enhance RFAs’ capacity and expand their roles in the GFSN. First, RFAs’ capacity in economic surveillance. This is a key element to support their members in identifying risks and vulnerabilities. A robust methodology for vigorous surveillance and early warning exercise are essential for RFAs in preventing and anticipating crisis and spillover. Second, RFAs’ quick response in supporting their members in resolving crisis, including in providing policy advice. This will help members to regain their economic and financial stability with sound economic policies. Third, reliable instruments for crisis prevention and resolution. RFAs are continuously calibrating their facilities to better suit the needs of their members in a constantly changing environment. This is a timely topic for discussion as the IMF is now revamping its facilities as part of its effort to enhance the effectiveness of the GFSN. 7. All these three important aspects will be discussed in this seminar, which will provide RFAs and the IMF a valuable opportunity to share information and experience in this regard. We have an impressive list of speakers and panelists today who will bring prominent and far-reaching views and perspectives to the table. I am confident that we will have a very informative, illuminating, and enriching discussion. 8. It leaves me now to hand over to Mr. Klaus Regling for his keynote address. Mr. Regling is the current and first Managing Director of the ESM. He has a deep knowledge of issues pertaining to RFAs and the GFSN, from his many years of experience in the IMF and the ESM, especially during the last several years dealing with the European sovereign debt crisis. Mr Regling is also familiar with the Asian region as he spent two years as the Resident Representative of the IMF in Jakarta back in the early 90s and as a visiting Fellow at the Lee Kuan Yew School of Public Policy here in Singapore in 2009 where he conducted research on financial and monetary integration in Asia. 9. Today he will share with us his thoughts on how research helps RFAs to sharpen their analytical capacity. He will also touch on the issue I mentioned earlier on the productive relationship between RFAs and the IMF.It is my pleasure now to invite Mr. Regling to deliver the keynote address.